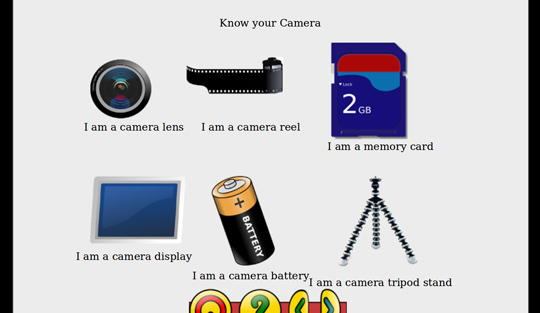 This camera simulation implementation is an interactive training tool made for kids to allow them to visualize the outcome of digital photos. This application consists of a screen with a grid on the top left which enables photo selection to carry out experiment. The selected picture is displayed on the photo board. 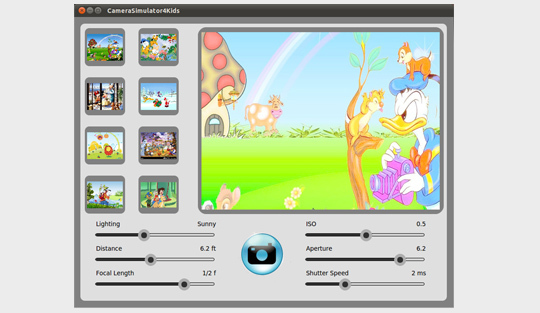 Slider controls on the bottom of the screen aids in demonstrating the six major camera functionalities including Lighting, ISO, Aperture, Distance, Focal Length, Aperture, Shutter Speed. To begin with, distance control is used to simulate how close or far you are in relation to the subject. Moving the focal length slider is the same as zooming in and out using camera lens. Shutter speed slider can be used to experiment with different indoor and outdoor lighting conditions or to capture or freeze the motion of pictures. Aperture on the other hand is connected with the shutter speed and indicates depth of the field. ISO property can be altered to generate over and underexposed photos. Camera button helps to capture the simulated picture in order to observe the result pattern.